Samsung Electronics is debuting its new OmniTom mobile 16-slice CT scanner at the RSNA 2017 meeting in Chicago. Features of the scanner include omnidirectional wheels, 16-slice (0.625 mm per slice) data acquisition, a gantry opening of 40 cm, and an internal drive system. The OmniTom has a rapid scan time with immediate scan viewing that makes it particularly suitable for cranial procedures, according to the company. Samsung Electronics debuts the OmniTom mobile 16-slice CT scanner at RSNA 2017. Image courtesy of Samsung. 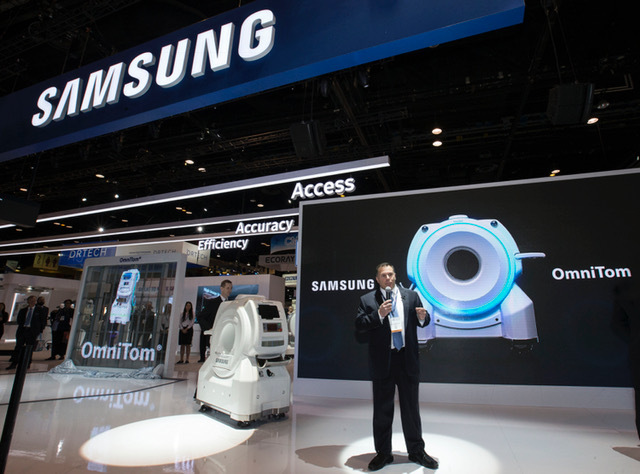 At RSNA 2017, Samsung is also demonstrating its HS60 and HS40 ultrasound systems, GM85 mobile digital radiography system, and a prototype of its Specialty MRI device for arms and legs that eliminates the need for a patient's whole body to be in the MRI system. Samsung debuts new mobile DR unit in U.S.